I found this photo in one of my favorite bookshelf tumblrs and I immediately salivated. WANT. 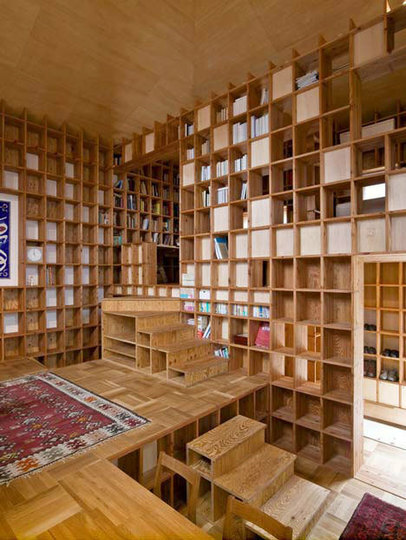 This 52 square meter (560 square feet) private home in Japan was designed to artfully store the client’s massive collection of books. 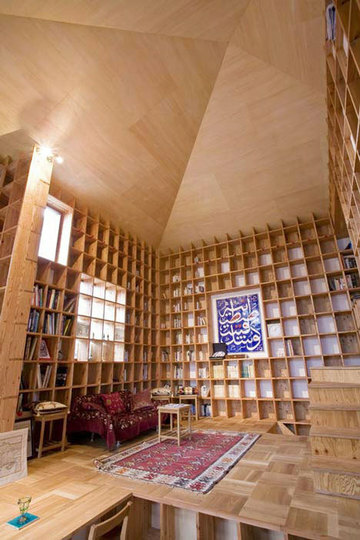 With pine shelves covering every wall surface, the open-plan home is a bibliophile’s dream! Definitely a bibliophile’s dream! All those shelf space — even the steps have spaces for books! I would probably stare at the books all day and re-arrange them every now and then to change how it looks. 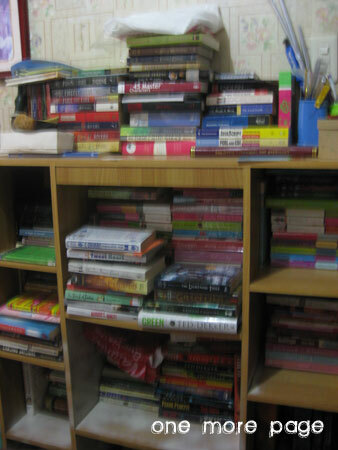 And I bet I will have more reasons to acquire more books because of all this shelf space. I also love that there’s a little area that acts like a desk (or maybe a dining table) down at the bottom. I would have to live in this house — or at least have a room in my dream house built the same way! I bet it would be kind of hard to dust this kind of house, though. Imagine all the shelves you need to wipe off every now and then. I have been trying to stop myself from buying books lately not because money is short, but because I have no shelf space. Ever since the flood last year, my room has been made into semi-storage that can only be livable. See, the flood destroyed my brother’s room so he no longer has a closet or a desk or whatever. He may be moving out soon since he’s getting married in a month, so having no storage is okay with him (I think). So now, my room stores his clothes, other clothes and of course, my things. I don’t sleep or hang out much my room unless necessary, so it’s really just more of a storage room than an actual bedroom. That just made me realize that I haven’t had my own bedroom for almost a year now. OH. Of course that picture isn’t accurate since I added a lot more books after my birthday. 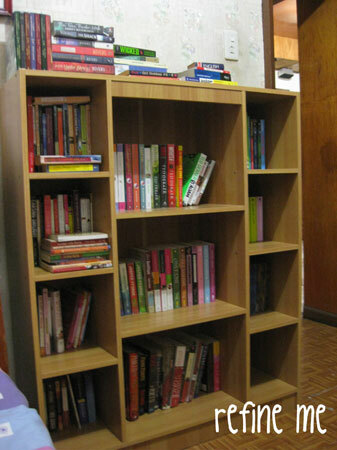 But I always tried to keep it organized since this is the bookshelf I had been waiting for for how many years. 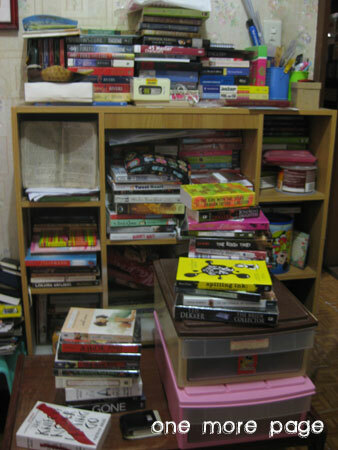 Look at that bookish mess. My shelf has become a house for not only books but for other things because I lost my desk and my original bed to the flood. Most of the other stuff in my headboard and my table were stuffed in the available space on my shelf, making it quite a mess. The books in front of the shelf on the table are the new books I bought for the past months, which had no room on the shelf itself. See why I am hesitant to buy new books? It’s going to add to that mess. Ebooks are more convenient! Here's how it looks like without the table in front. But I digress again. Since today is a non-working holiday, I decided to finally, finally tackle the mess that is my shelf and put some semblance of order in it. I also wanted to see if I can clear up some shelf space by selecting books that I didn’t like and/or know I won’t read anymore to give away/donate/put up for prizes/whichever. So how did I tackle the book shelf cleaning? Oh, and Fully Booked Eastwood is on sale until Sunday — 20% off on all regular titles. :) Looks like someone won’t be splurging on Mytouch 4g accessories yet. 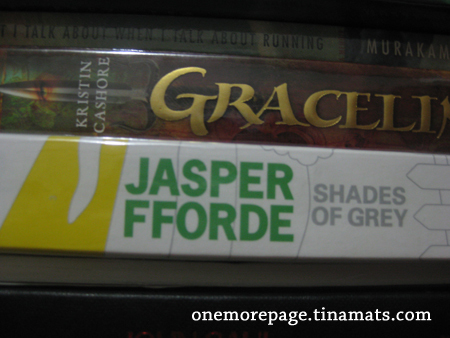 And to those who are curious, the books above Shades of Grey are my to-be-read copies of Graceling by Kristin Cashore and What I Talk About When I Talk About Running by Haruki Murakami. Okay, time to go back to Persuasion. The sooner I finish this Austen, the sooner I can get cracking with these books. Have a great weekend everyone!